Content analysis is a qualitative method for identifying themes among a collection of documents. The themes themselves are either derived from the content reviewed or specified a priori according to some established theoretical perspective or set or research questions. Documents are read, content is considered and themes (represented as letter “codes”) are applied. It’s not uncommon for documents to exhibit multiple themes. In this way, results from a content analysis are not unlike responses to the “select all that apply” type questions found in survey research. Once a set of documents is coded, it’s often of interest to know the proportion of times the codes were observed. The following R code transforms codes on a set of documents, stored as a list of lists, into a binary matrix. If we print the data to the screen, we see themes are represented as binary variables, where 1 indicates a theme was observed and 0 indicates it was not. Once the data are organized as a binary matrix, we can calculate column totals colSums(theData4[,codeList]) to see which themes were more popular and which ones were least popular. 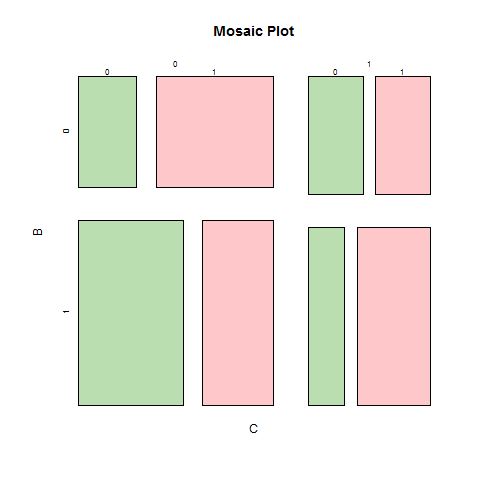 And lastly, if we want to get fancy, we can represent the data using a mosaic plot. A mosaic plot shows the relative proportion of each theme compared to one or more of the other themes. The main two rows show the levels of theme B. The main two columns represent theme C’s levels. And the two columns within the two main columns represent the levels of A. By default, the label for theme A is not shown. The cell in the upper left-hand corner, i.e. cell (1,1), shows there were some but not many documents without any themes. Cells (1,3) and (1,4) show there were an equal number of documents with theme C as there were that involved themes A and C combined. The remaining cell in this first row (1,2) shows there were more documents pertaining solely to theme A than all other document types not containing theme B. Interpretations of the remaining rectangles follow similarly. The syntax takes every HTML file in a folder and generates from it a PDF file. The wkhtmltopdf command options modify the files generated: -g sets greyscale, -s Letter sets paper size, and --no-background omits background content. For more options check out the wkhtmltopdf auto-generated manual. This post describes how to identify group structures among a network of respondents in VISONE. For a network of selections we identify any cliques involving three or more members. A clique is defined as a group containing three or more members where everyone has chosen everyone else. 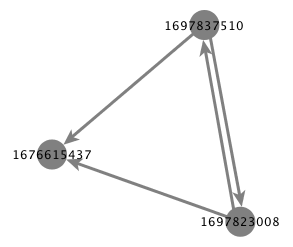 A tried is a network structure containing exactly three members. There are many types of triads. A group of three members where everyone chooses everyone else is a triad (i.e., a clique). A group of three members where two people choose each other and nobody choose the third member is another type of triad. There are 16 unique ways three people can select each other. Identify all triads. Click the ‘analysis’ tab. Next to ‘task’, select ‘grouping’ from the drop down list of available options. Select ‘cohesiveness’ from the drop down list next to ‘class’. 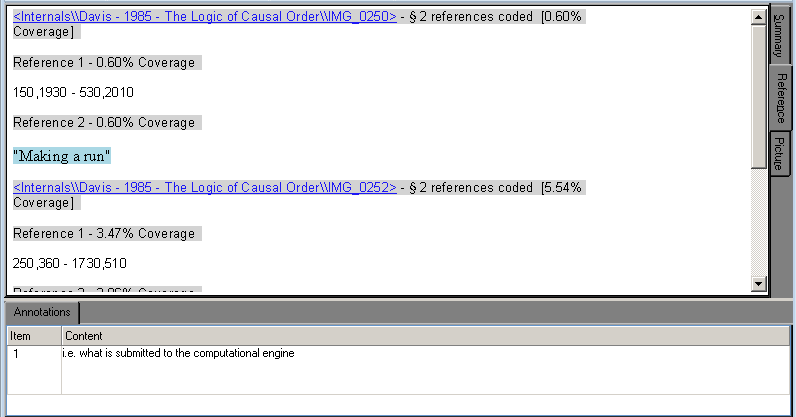 Select the option ‘triad census’ next to ‘measure’. Click ‘analyze’. Highlight all cliques. Click an empty part of the graph. Press the keys ‘Ctrl’ and ‘a’. Open the attribute manager. Click the ‘link’ button. Click the ‘filter’ button. Select ‘default value’ from the first drop down list. Select ‘triadType300’ from the second drop down list. 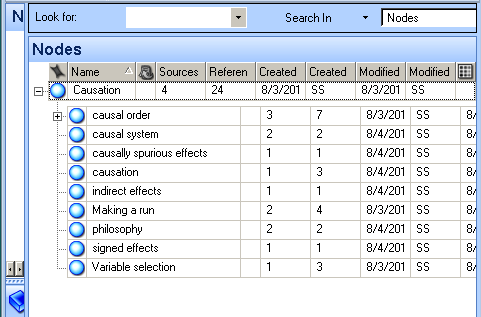 Select ‘has individual value’ from the third drop down list. Click the radial button ‘replace’. Click ‘select’. Click ‘close’. From the main VISONE drop down bar, select ‘links’. Click ‘properties’. Click the given color next to ‘color:’. Select ‘rgb’ tab. Set the ‘red’, ‘green’, and ‘blue’ values to 0. Set the ‘alpha’ value to 255. Set ‘opacity’ to 50%. Click the ‘close’ button. Set the ‘width:’ value to 5.0. From the ‘edge properties’ dialogue box, click the ‘apply’ button. Click ‘close. Reduce visibility of all non-clique selections. Select all nodes and links. Click an empty part of the graph. Press the keys ‘Ctrl’ and ‘a’. Open the attribute manager. Click the ‘link’ button. Click the ‘filter’ button. Select ‘default value’ from the first drop down list. Select ‘triadType300’ from the second drop down list. 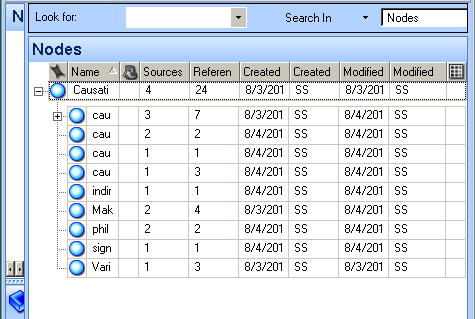 Select ‘has individual value’ from the third drop down list. Click the radial button ‘remove’. Click ‘select’. Click ‘close’. From the main VISONE drop down bar, select ‘links’. Click ‘properties’. Click the given color next to ‘color:’. Set ‘opacity’ to 20%. Set the ‘width:’ value to 2.0. From the ‘edge properties’ dialogue box, click the ‘apply’ button. Click ‘close. 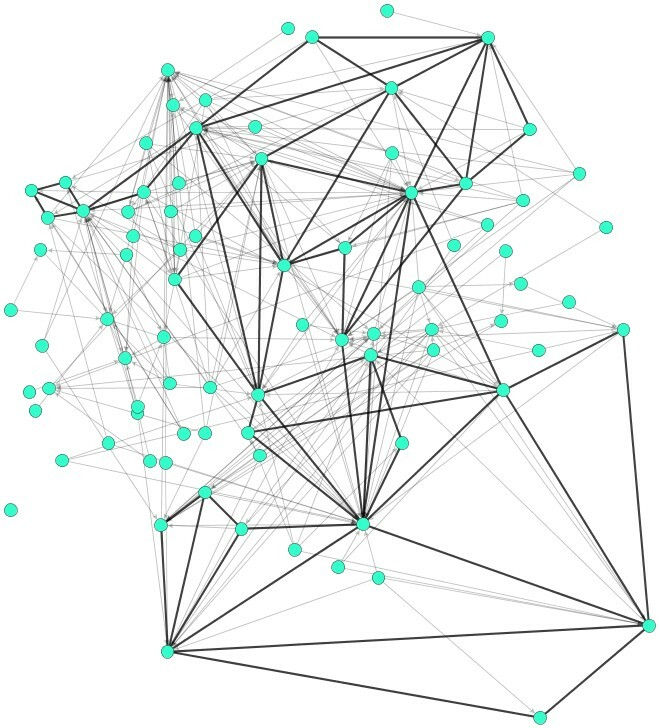 In a previous post I wrote about highlighting a subgraph of a larger network graph. In response to this post, I was asked how extract a subgraph from a larger graph while retaining all essential characteristics among the extracted nodes. The code is well written and only highlights the members of a subgraph. 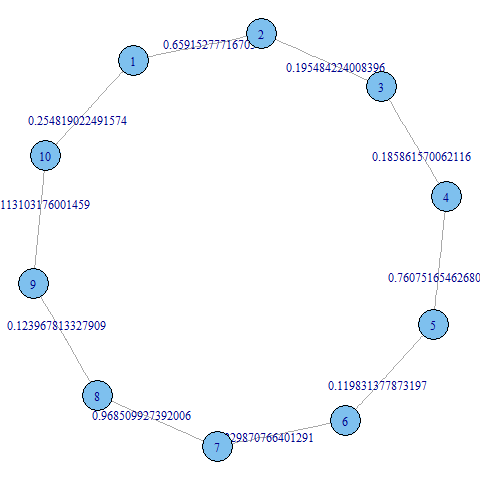 I need to fetch them out from the main graph as a separate subgraph (including nodes and edges). Any suggestions please. The Twitter API teaches me that at best anyone on Twitter can follow anyone else on Twitter without anyone followed knowing anything about it. The Twitter API reveals this through the resource ‘GET statuses/user_timeline‘, a resource which allows anyone with a little programming know-how to anonymously download 3,200 of the most recent tweets made by any public Twitter user. While following Twitter users in this way is readily available to those with a coding background, it is itself not particular to people with such knowledge. Any Twitter user can do it. It is as simple as typing a phrase into the search field (or the search field of the search page) and hitting enter on the keyboard. All those tweets that barrel down the Twitter stream arrive in this way, literally without warning. Advanced search options also exit, but you get the idea. 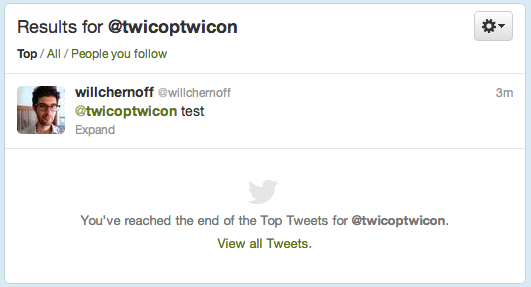 The ability to search and recall tweets anonymously on Twitter is not a defect, it’s a feature. 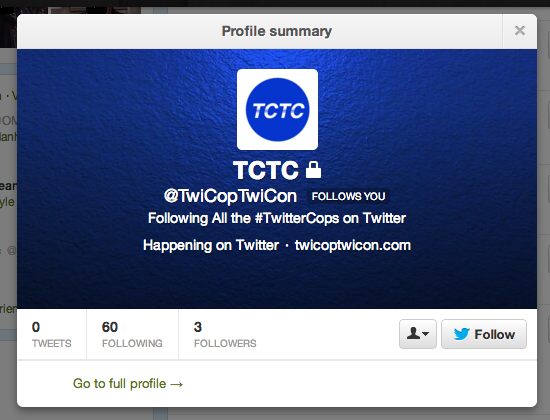 Your Tweets will only be visible to users you’ve approved. Other users will not be able to retweet your Tweets. Protected Tweets will not appear in Twitter search or Google search. @Replies you send to people who aren’t following you will not be seen by those users (because you have not given them permission to see your Tweets). You cannot share permanent links to your Tweets with anyone other than your approved followers. In this way, Twitter makes their service available to a number of people who don’t want everything they have to say on Twitter made publicly available. But even with privacy settings in place, some pieces of user information aren’t protected. Any Twitter user can see some of what other users are saying about any other user on Twitter. Twitter users share with other Twitter users their basic profile information, information which includes tweets, following, and followers counts. At most this can include a location, say a city or state, and a personal webpage. A Twitter profile can be seen in greater detail through the API, so that any Twitter user can know when any other Twitter account was created. Who follows a Twitter user and who else these followers follow is not entirely hidden, connections which can help reveal social networks. Not everything a user does on Twitter is hidden from sight, even when privacy settings are in place. This issue is problematic in that it leads to a false sense of data security, where in which what Twitter and Twitter user’s think is hidden do not necessarily correspond with one another. I have no reason to suspect the social media organization Twitter of actively threatening the security and privacy of its users, but they could make more of an effort to identify and present, in an accessible way, the metrics about their users which are publicly knowable. They know these things. It’s not necessarily outrageous to think they could let us know these things too. Twitter probably knows as well as anyone else that they doesn’t know what’s best for their users; and that only their users actually know what’s best for themselves, but users can’t adequately weigh the pros and cons of their use when they themselves don’t know what’s not hidden. By taking the time to do this, Twitter can better inform their users (and potential users) about their social media presence and better support us all in our use of social media. On average, when setting their security options, users implicitly assume that what they can allow or deny others to see, as provided by any social media service, is an exhaustive list of all accessible information. The preliminary exam in almost any graduate program requires the organization of a tremendous amount of reading material. One of the preliminary exams I’m taking, the one in social science research methods, for instance, requires a familiarity with over 40 unique sources, spanning 18 distinct topics. That’s a reading list of over 4 pages in length! Furthermore, the exam requires that I write three ten page papers over the course of three consecutive days regarding three unknown methodology questions drawing from potentially any and all of the materials on the reading list. It’s a lot to read and a lot to recall. To organize the information in these reading materials, and speed up my ability to recall topics, quotes and my own notes on them, I tried using a qualitative data analysis (QDA) software system, a preparation strategy which I really wish had worked better. Generally speaking, QDA software systems allow researchers to organize qualitative data. These suites allow researchers to select content across a number of documents and classify all their selections under different themes. In a slightly more technically way, content across many documents can be selected by a researcher using QDA software, content which they can then in turn associate with different nodes (i.e., themes), both to which they can apply numerous annotations. Content and themes created in this manner can then be relabeled and nested (or unnested) based on the sense-making of the person doing the research. Content selected in this way is recalled by simply double-clicking on the node associated with it. The result of all this work is a spidery network of content, which, as an organization method, offers some attractive qualities. Organizing content, themes, and annotations by nodes and links is potentially a convenient, timesaving data organization strategy. 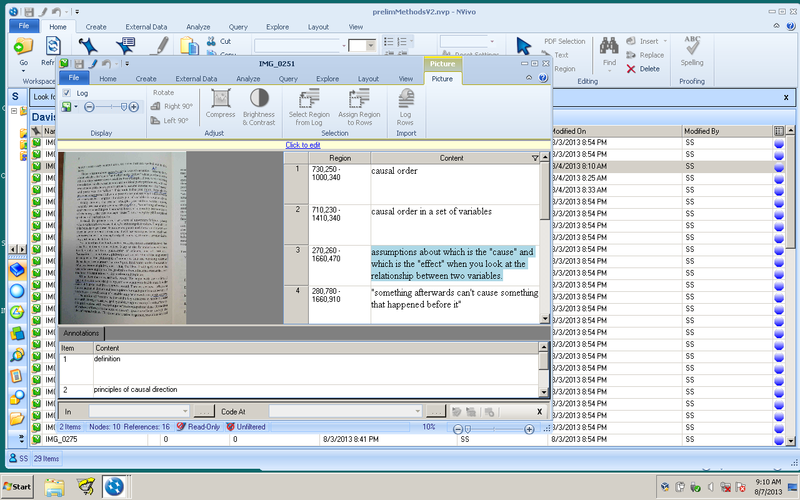 No longer must researchers copy and paste important quotes from their documents into separate files. Instead they can work directly on their documents and tag, with a flick of the mouse, whatever they think is important. No longer must researchers work with long note outlines. Content is important, of course, but, when trying to make sense of a large collection of identified themes, content items can at times get in the way. Nodes and content are generally shown in QDA packages using separate windows, which simplifies the outline and allows for easier theme management. In this way a researcher can spend more time thinking about how their themes relate to one another and only look at quotes and annotations when they actually need them. No longer must researchers keep track of page numbers. Each content item is tied to the original page within the document it was found. Page numbers, in this way, need only be written out by a researcher when they themselves are actually ready to write about the content referenced. Front loading page numbers is a lot of work and needless work when the content items identified do not make it into the working document. QDA software packages are a promising way in which researchers can spend more time reading and thinking about their content than explicitly managing it. 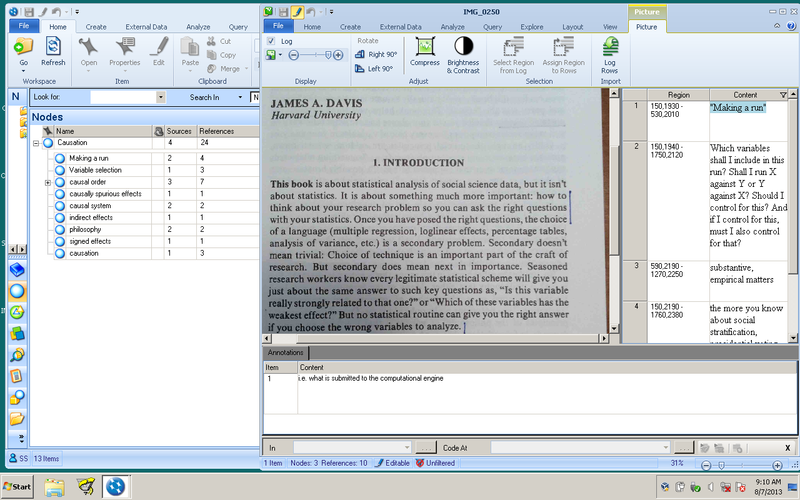 To investigate QDA, I looked into QSRI’s software suite NVivo 10. Plenty of great tutorials exist on how to use NVivo 10, put out both by QSRI and members of the NVivo community. For this reason, I’m going to spend more time talking about what I didn’t like about NVivo 10 than how to specifically do certain things with it. Suggestions are also provided as to how NVivo 10 could potentially be made more effective. Resizing the column ‘Created On’ resized all other columns as well, most notably the ‘References’ column. These others columns themselves now need to be corrected, which requires the user to do extra work. This needs to be fixed. Resizing the column ‘Name’ misaligned the column names of the node matrix. Because of this, tracking columns names now falls to the user, which is work, extra work they might prefer not to do. This needs to be fixed. Content selected by ‘Region’ isn’t shown when opening an ‘Open Node…’ frame. Instead, the region coordinates of the selected content are shown. The point of retrieving content is to actually get the content and not a list of instructions as to where it is the content is located. Content retrieval executed in this way actually passes the burden of content retrieval to the user. 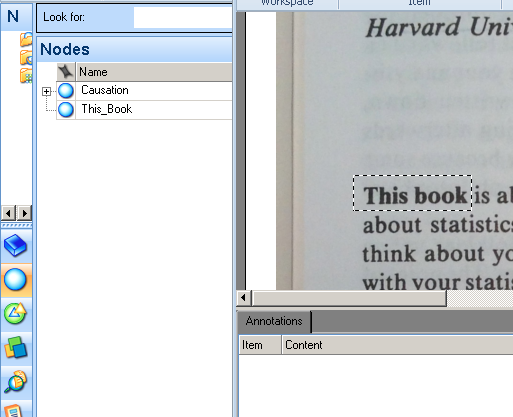 Selected content can be viewed in the ‘Open Node…’ frame under the ‘PDF’ tab. Even though the unselected part of the document is masked, the content is only found by scrolling around the document itself. This has the benefit of connecting the content with the page it’s on, but getting the content still requires the user to do the work. Is it possible, upon opening an ‘Open Node…’ frame, to generate and display an image of the region selected instead of the coordinates at which it is located? Or, alternatively, is it possible to make available the tools usually available when working with image files when working with PDF files? PDF files are not treated the same way as image files, though working with PDF files might be easier if they were. When working with an image file, selected regions can be inserted into a table using the ‘Insert Row’ option. Doing this allows a user to more or less overlap a comment with a selected image region, a comment which can then be connected to a node and recalled as text when needed. In this way, a scanned document can be coded, which, in a round about way, can include a PDF file, when the PDF file itself has first been exported to collection of image files. This conversion process, however, is a lot of work when working with multiple PDF files and when the PDF files themselves each contain multiple pages. Is it possible to include a bulk file conversion function with the software suite? Content annotations are retrieved and shown when opening an ‘Open Node…” frame. However, separating annotations from the content items to which they refer requires the user to do added work when transferring their content to a working document. Instead of copying and pasting at once all retrieved content from an ‘Open Node…’ frame to a working document, the user is required to intersperse, in some manual piece-by-piece way, their annotations among the content items they transferred. It falls to the user to copy an annotation, search a working document for the annotation’s associated content item, and paste it into place. Why not give users the option, when viewing a node in an ‘Open Node…’ frame, to have their annotations inserted in-line with the content items themselves? Removing a selected content item from a node requires the user to first find the original content item they selected. This isn’t so bad, since the software mostly keeps track of this through nodes, but it still requires the user to find and select the item they originally selected, which can require extra work on behalf of the user. Why not let users deselect content from nodes through the ‘Open Node…’ frame? Every time a user opens a document they must adjust the UI so as to work with it. With a lot of files, this means doing the following sequence of steps repeatedly: ‘Click to edit’, move and readjust the frame, readjust, when working with images, the region-content table, zoom in on the file viewed, reselect ‘Nodes’ from the navigation pane. This is too much work. Why not make newly opened documents default to the last configuration specified by the user? Or, alternatively, why not implement a tab system of sorts where files can be opened into the user adjusted workspace? To be fair, NVivo 10 does everything I want a QDA application todo. It lets me select content, associate content with different nodes, nest and unnest nodes, modify node labels, annotate content and nodes, and, most importantly, recall everything done with simply the click of a mouse. However, NVivo 10 falls short regarding content selection options and UI design, which in turn create extra work for the user. One scanned PDF document, for instance, can, when converted to a collection of images, require a user to manage about thirty separate files, files which require the user to do a lot of unnecessary software fidgeting. This fidgeting with NVivo adds up fast and quickly outweighs the productivity gains had in using the software. At this point in its development, I don’t recommended NVivo 10 to most other graduate students looking for an effective means by which to better manage their preliminary exam materials. In order to get data from Twitter you have to let them know that you are in fact authorized to do so. The first step in getting data from Twitter is to create an application with Twitter. The interested reader should explore the section “Where do I create an application?” under the FAQ for instructions on how to create a Twitter application. To authenticate a data request from Twitter we simply need to send the appropriate credentials to Twitter along with our request for data. The site dev.twitter.com provides useful step-by-step guides on how to authenticate data requests (see specifically the documents creating a signature, percent encoding parameters and authorizing a request), guides which we’ll explore here in the context of the R dialect. Install and load the R packages RCurl, bitops, digest, ROAuth and RJSONIO. Access your Twitter application’s oauth settings (available under the OAuth tools tab on your application page) and save them to a data frame object. Each time you request data from Twitter you will need to provide them with a unique, randomly generated string of alphanumeric characters. Generate and save the current GMT system time in seconds. 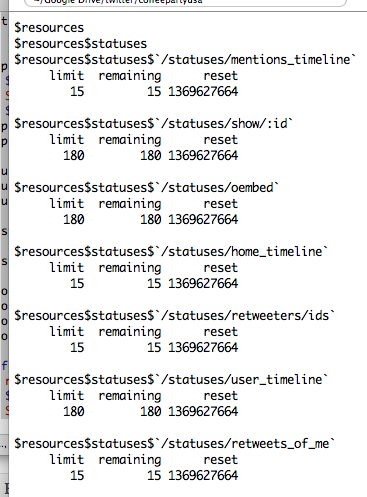 Each Twitter data request will want you to include the time in seconds at which the requests was (approximately) made. Order the key/value pairs by the first letter of each key. In the current example you’ll notice that the labels to the left of the equal signs are situated in order of ascension. Once ordered, we percent encode the string to create a parameter string. The parameter string is then extended to include the HTTP method and the Twitter base URL so as to create a signature base string. We then create a signing key. The signature base string and the signing key are used to create an oauth signature. These results can than be passed to the function getURL() so as to download the desired Twitter data, such as status rate limits. To reduce repetition, I’ve wrapped the above code into an R function called keyValues. Twitter data requests now appear, on the user end of things, to need less code through the use of this function. Make sure to run the keyValues() function and the fromJSON() function within a few seconds of each others, or else Twitter won’t respect your data request.